The 5 day group courses generally run from Sunday to Thursday with Friday as the day off. (We may change the day off weather depending). Unless you are planning to take a day or two extra at either end of your trip, you should travel out and back Saturday to Saturday and we offer a transfer from Geneva airport for these dates too (full details lower down – please read before booking flights if you wish to book the transfer). The courses are designed to build and develop skill and confidence, to enable people to ski all terrains including Moguls, Steeps, Variables, Powder and how to Carve effectively on piste. Skills are developed during the coaching by practicing specific exercises that benefit the main topics. Progressively, the new levels of skill are tested in suitable terrains to build confidence. During the group courses each skier is also looked at from an individual point of view due to the fact that we are all individuals and have different strengths and weaknesses that need identifying and developing. The courses are ideal for skiers who are looking to develop their skiing on a regular basis and not have to wait for the Winter season. We meet together as a group each morning just before 9am outside the Hotel Mon Reve. On the first morning (Sunday) we will head to the lift station a little early to allow some time for everyone to purchase their lift passes. You will need an international lift pass (covering Zermatt) for the course. We ski each day from 9.15am until 2pm and take a lunch break at approximately 12.00pm. Please bring a small or medium size backpack to store your bottle of water and energy bars in. It can also carry your belongings i.e. Ski Jacket, Fleece, Gloves etc if the weather is extra cold or warm. 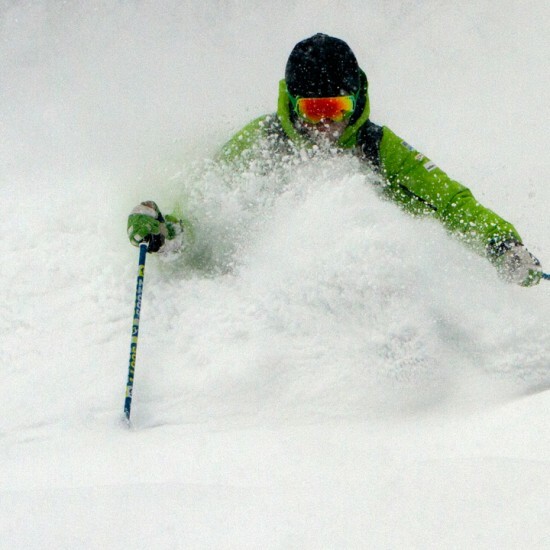 Please note that Wednesday is a rest day from the course and a day for you to freeski. We will be filming and doing video analysis on the 2nd and 4th days and watching the footage and analysing it those evenings before dinner from 5.30pm until 7pm. It usually makes a big difference the next day with what you’re working on so it’s a good idea to bring a notepad and pen to make notes. The groups are a maximum of 8 persons. This is the standard number of persons on an Academy course. Over the past 12 years we have experimented with groups of 6 person and the coaching has been too intense. We have also worked with groups of 10 the coaching and feedback has not been intense enough. 8 persons is the perfect number to work through the exercises set, receive good individual feedback and get to move around the mountain to find the ideal terrain. To read reviews and testimonials on the courses, click here. One of the biggest areas of development on the courses is Ankle Flex development. 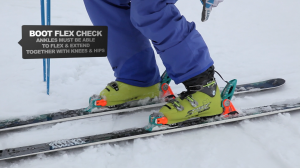 Most skiers join us with a lack of ankle flex. 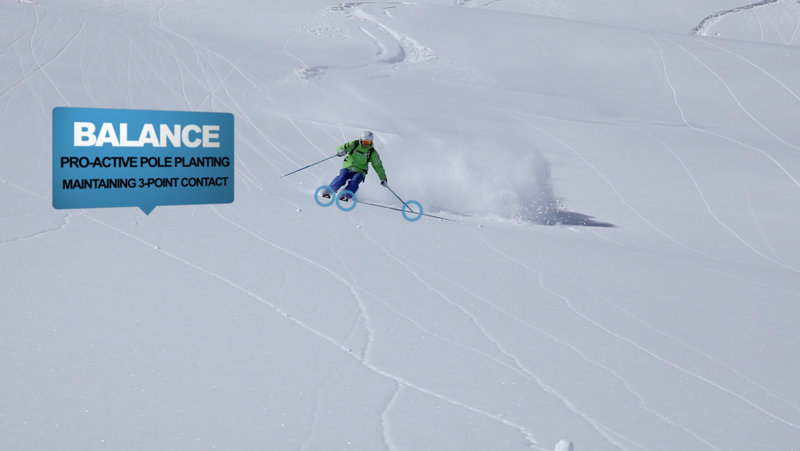 Most skier flex at the knee more than the ankle and this puts the skiers weight back. Once it’s back it makes it hard to steer and almost impossible to ski steeps, moguls and freeride terrain. Your thighs end up being used to help you stand up rather than being used to help you steer the skis. The reason that most skiers have a lack of ankle flex is that a lot of skiers learn to ski in boots that are too stiff for them to flex so the joint that compensates and does the majority of the flexing is the knee. A lot of skiers also suffer from having calf muscles that are too tight to be able to move and flex the ski boot. 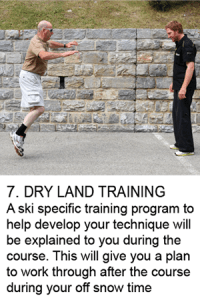 With specific ankle flex development exercises you will learn to dominate your ski boots and flex them so as to allow you to be in balance and maintain leverage in the legs to have powder to steer. Once you have this flex you automatically have power and in turn confidence. 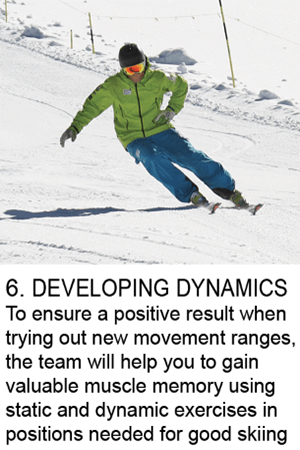 The learning process increases dramatically with this and your skiing takes a major step change in its level. 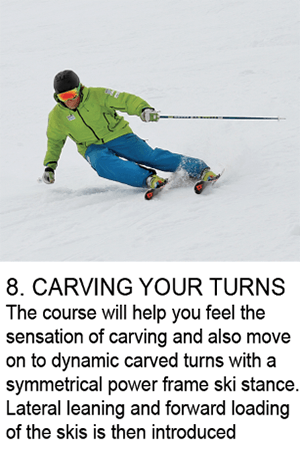 All skiers that come on the Academy courses, whether in Group 1 or Group 6, have a problem maintaining symmetry whilst turning. 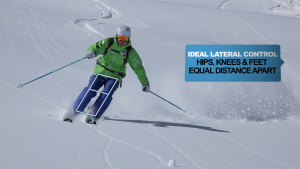 Perfect symmetry is skiing from turn to turn with your hips, knees and feet the same distance apart allowing both ski edges to be at identical angles. It’s common for most skiers to ski with either their knees dropping closer together or their feet splitting wider apart. Both of these create the classic A-Frame stance. 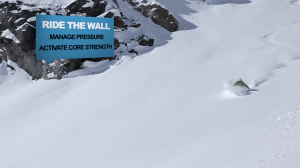 The A-Frame stance makes it difficult to carve, ski powder, moguls, steeps and generally build on your ski technique as your ski edge angles will always be different. On the courses we address this issue and leave you with a strong, symmetrical stance that allows you to build good ski technique on. 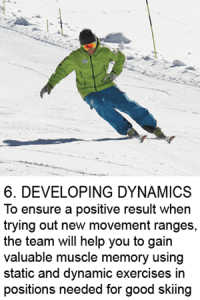 Whilst developing your ski symmetry we will work on biomechanical aspects such as switching on certain muscle groups that help maintain the ideal stance, checking your ski boots to make sure they are set up correctly and integrating the 0-Frame stance into your skiing. Having skier symmetry is crucial in preventing knee injury, fatigue, accidents whilst skiing and allowing you to reach your true skiing potential. Most skiers who attend the courses, even at Instructor level, steer their skis by foot steering. Steering the skis by foot steering is usually what you get taught in your first week of ski school tuition. Unfortunately it usually stays with you through your skiing life. Foot steering is weak and although it might get you through your first week of skiing it isn’t efficient for more advanced skiing. Foot steering can also put stress on the knee joint. 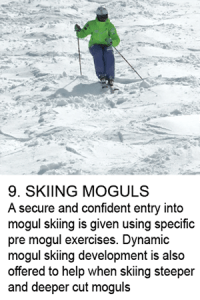 Thigh steering is a much more powerful way of steering your skis and allows you to steer with more confidence on steeper slopes, in moguls and in freeride terrain. 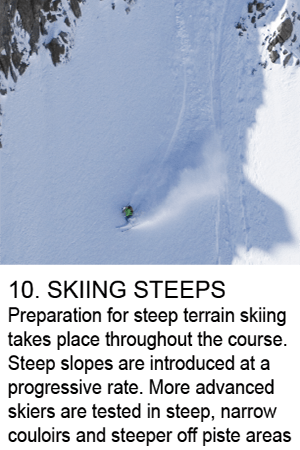 It also allows you to carve more effectively and move onto skiing higher speeds without loosing control. For thigh steering to switch on we develop specific exercises that provoke you to use the muscles in the legs that control this movement. 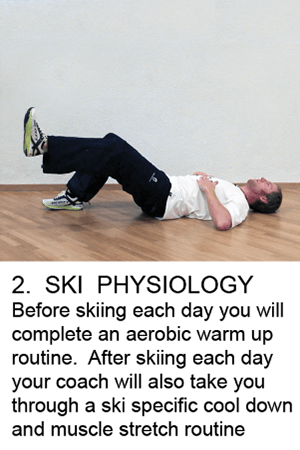 Once you find the muscles (usually takes about 15 minutes to switch them on) you will immediately feel stronger in your skiing and more secure. Once we have you doing this, other aspects of skiing we show you during the week are easily absorbed and changes take place in your technique with ease. All skiers suffer from having a weaker turn direction. 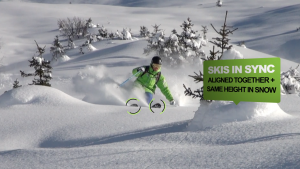 At the Academy we are fully aware of the importance for the skier to first feel the difference between left and right turns and then understand why there is a weakness with one side. With the sport of skiing you are only as good as your weakest turn. 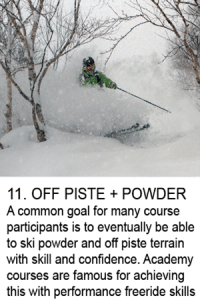 This is especially obvious in powder, slush, steeps and in moguls. Skiers generally have a weaker turn due to left and right side differences with the brain, injuries to certain sides of the body, imbalances on the left and right side of the body and equipment that might not be set up correctly. With the use of video analysis, exercises and biomechanical awareness we make you aware of your weaker direction, show you it on video and then build it up with specific exercises that benefit the weaker side of the body. Once you are balanced the sport of skiing will feel different to you and the foundation of you skiing will be strong and secure. 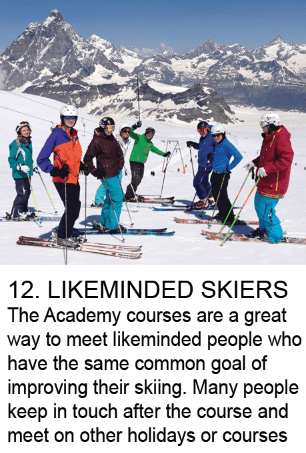 Nearly all skiers that join the Academy courses are never using their middle body strength to its full potential. Many skiers break at the waist when skiing moguls, powder or just carving at higher speeds. The more dynamic skiing becomes the more you need to activate your core whilst skiing to keep the middle body strong and avoid it collapsing. 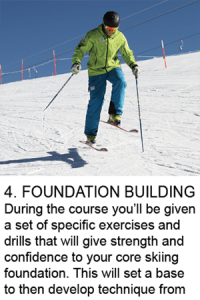 On the course you’ll learn how to activate your core whilst skiing with simple exercises that are easy to integrate into your normal skiing technique. 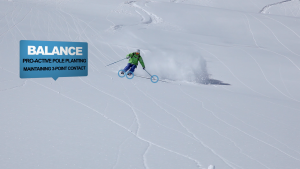 To assist your Moguls, Steeps, Variables and Freeride terrain skiing you’ll learn how to develop your pole plant timing and arm positioning. This gives your pole plant more overall strength and it will support your body effectively when initiating your turns in these terrains. Every skier that joins a course has their own individual skiing style. 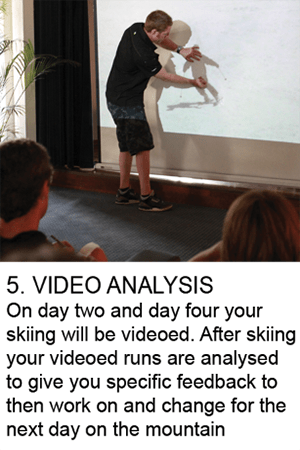 An important part of the Academy course is to offer each skier feedback on their own technique specific to them. This takes places at various times during the week. As well as the above topics various other aspects are also covered such as Short Radius Turns, Developing Leg Lean, Progressive Steering, Loading the Skis, Skidding and lots more. 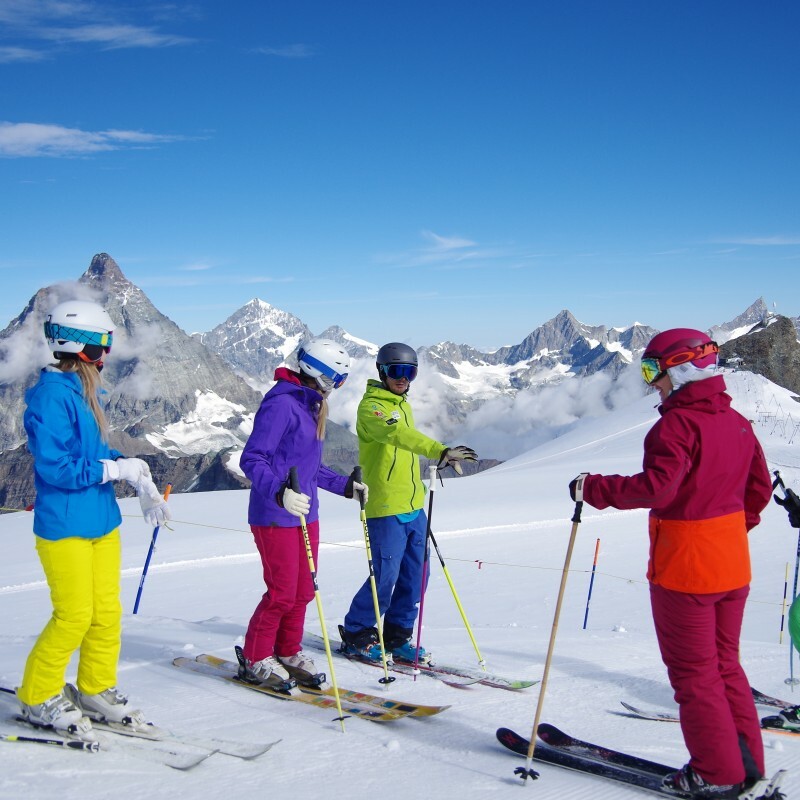 Many skiers attend several course during the year whether Winter in Verbier, Spring or Autumn in UK or summer in Cervinia. Skiers ability levels range from basic intermediate skiers wishing to get off the typical intermediate plateau (Level 1) to skiers taking their instructors exams and performance training for competition (alpine racing, freeride or freestyle)(L6). On the first day of the course we have a ski-off where we split the whole group into smaller individual groups based on their ski ability and confidence. 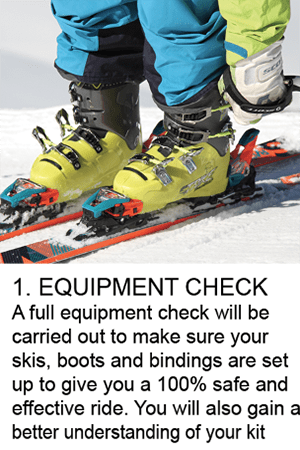 To easily identify the levels of skiers, and roughly assess which level you currently are, please click here. Car: Easy to reach, served by the A5 Torino-Aosta motorway. 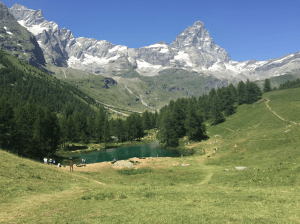 Take the Châtillon/Saint-Vincent exit and head along the regional road to Cervinia for 28 km. Valtournenche is 19 km after Châtillon and 9 km before Breuil-Cervinia. Coach/Train: The nearest railway station is at Châtillon/Saint-Vincent (info and timetables www.trenitalia.it). 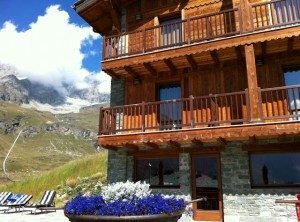 From Châtillon, and also from Turin and Milan, there is a coach service to and from Breuil-Cervinia Valtournenche (info and timetables www.savda.it). Airplane: Transfers are facilitated by the short distance from other international airports of Turin Caselle (118 km), Milan Malpensa (160 km) and Milan Linate (180 km). Transfers to and from the airports can be arranged by coach, taxi or car rental. For impeccable service and regular low cost flights from the UK to Geneva or Zurich please visit our partners at SWISS. The elegant and spacious all raw-wood valdostan design creates a warm and familiar environment. Please note the price includes breakfast but not dinner and not tourist tax.